Well, he's "getting" Chris Christie into the state for a private fundraiser. If there are any firm plans to show Christie off to ordinary voters, it hasn't surfaced yet. But by all means, yes, let's get some Republican female-brand furniture stripper like Laura Ingraham in to rigidify Mr. Tillis's anemic conservative credentials. 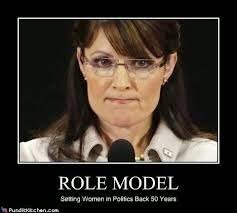 And Sarah Palin. Oh, especially Sarah Palin! How could Tillis go wrong with the woman recently made famous by a dog-pile fracas that erupted at a snowmobilers party in Alaska? The quote I loved from that: "The party was peaceable until the Palins arrived." We can feel Mr. Clifton's pain. After tens of millions of $$ expended to tout Thom Tillis and to attack Kay Hagan, millions by Karl Rove and other third-party interlopers, Tillis has zero traction ... largely because he's dragging around a very unpopular NC General Assembly as a major anchor on his hopes. To be blunt, neo-con Tillis is the establishment's choice on the Repub's side, because either one, Hagan or Tillis, is acceptable. Tillis won his primary, because extra candidates were presented on the slate to water down Brannon's support. Believe it or not.